This might be a less interesting post for some readers. It features a relatively boring sunrise with no spectacular colored clouds or sky. But I wasn’t about to waste 27 time-lapse images, so allow me to explain the story behind this. The area you see in the animation is the east yard of my home. It’s a nice flat area, covered with crushed granite, and the place where our astronomy club usually sets up their telescopes when we do observing. Earlier this year I started seeing strange tracks out there. And my German Shepherd seemed keen on following the scent along those tracks. Something was visiting during the dark of night. Possibilities included mule deer, javelina (wild boar), feral dogs, coyotes, bobcats, or a mountain lion (one of which had been reported in our area). I wanted to know what it was, for obvious reasons. But crushed granite doesn’t take very good track impressions. So I took some photos of the “better” tracks, and sent them to Arizona Game & Fish. They said it was difficult to tell from the low-res shape, but from the depth of the impression, whatever it was, it was big. Now I was even more curious. Unfortunately, I don’t have a trail-cam and didn’t want to purchase one. Nobody I know had one to loan. But I do have a handy device called an intervalometer that attaches to my Canon EOS 20D. It can be set to take photos automatically at whatever intervals I choose. It’s my go-to device for time-lapse sequences, but it also allows my DSLR to act like a trail-cam. The EOS 20D has a “night vision” mode, but I never purchased the infrared emitter option. Nor does it have a motion sensor, like most trail cams, so it wouldn’t be triggered by the presence of critters. So I replaced the white light bulb in the east yard fixture with a dim red one. Then I set the intervalometer to take photos once every minute, inserted my largest flash memory card (4 GB for my camera), attached my wide-angle lens, and mounted the camera on a tripod near the house. I did this several evenings in a row, and never did catch anything passing through the field of view. Maybe the red light scared the critters, or maybe it was the incessant clicking if the shutter, or the appearance of a tripod in a normally vacant location. Whatever the reason, my attempt was a fail. However, I did have several nice time-lapse sequences showing the sunrise behind Gavilan Peak, the mountain just east of me seen silhouetted in the animation. To put things into scale, the summit is about 230 meters (750 feet) higher than my elevation, and the summit is about 400 meters (¼ mile) distant. Wanting to salvage what I could from this experiment, I decided to write a post about the astronomical process of sunrise. For much of the year, Gavilan Peak delays the sunrise by close to an hour. Not a bad thing during our Arizona summers. Alas, at night, it also delays the appearance of celestial objects by the same amount of time. But that’s a trade-off I’ve come to accept. If you think you see some movement on the right side of the animation, it’s just the shadow of my car being formed by the brightening sky. You can tell from the rising dome of light that the Sun is right behind Gavilan Peak. Of course, the Sun isn’t really “rising” — Earth is rotating toward the east, carrying you along. And that ever-brightening dome of light that appears to be “rising” is the result of Earth’s own shadow (aka “night”) retreating toward the west. It’s worth repeating this basic astronomical fact about the transition between night and day, since we can’t really sense Earth’s rotation. 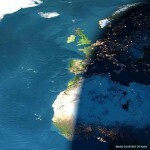 The thumbnail below show the reverse process (sunset) as seen from space. As the Earth rotates to the east, cities are carried into Earth’s shadow (the night side). Note the bright city lights appearing after dark. Click to enlarge. Both sunrises and sunsets can be accompanied by spectacular cloud colors, though its far more common during sunsets. Cloud formation is a natural result of the air cooling, which happens at sunset. In Arizona sunsets, there’s also fine desert dust in the air, especially after a windy day. That’s how we get spectacular sunsets like this one. There’s one more reason I decided to animate a sunrise. Work schedules these days seldom allow people to enjoy them. We’ve all seen our share of sunsets … they’re at a more convenient time of day. For a sunrise, you need to get up earlier than most people prefer. And if you’re on the road to work, your attention is on the traffic — hopefully. So enjoy this sunrise from the safety and convenience of your computer (not on your smart phone while driving). Better yet, get up early on a day off and enjoy the spectacle for real. Seeing night becoming day is a different aesthetic and emotional experience than seeing day becoming night. And in case you were wondering, yes, I managed to get the lens cap reattached before the Sun actually appeared over the summit. Direct light from the Sun would surely have damaged the camera’s CCD.